If you are involved in health care decision making, working in a hospital, university, foundation, industry or government, at any stage of your career, SMDM can provide you with a scholarly home and opportunities for collaboration, professional growth, networking and mentorship. The connections you make through SMDM can help you build a network of long-term contacts to help you throughout your career. SMDM offers special pricing to trainees and people working in Middle- and Low- Income Countries. Moved? Update your information so you don't miss anything! SMDM Members can access the directory through SMDM Connect. Search for members by name, organization, location, or professional interest. We are an international, transdisciplinary group drawn together by our commitment to improving the health of individuals and populations. 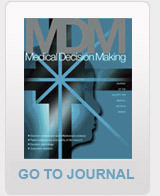 SMDM has opportunities for institutions to support medical decision making through its Institutional Membership program.